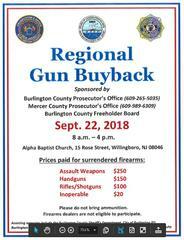 The Burlington County Prosecutor's Office, Mercer County Prosecutor's Office, and Burlington County Freeholder Board, will be sponsoring a Regional Gun Buyback event on September 22, 2018. The event will be held at the Alpha Baptist Church, 15 Rose Street in Willingboro, from 8 AM to 4 PM. Burlington and Mercer County residents may turn in up to three guns. See the attached flyer for more information.